Packing lightweight and delicious food for an overnight or multi-day trip into the backcountry is a challenge but it doesn’t need to be. I met a group of boy scouts a few year ago who were hiking along at a snails pace with backpacks that looked so heavy it hurt just looking a them. When I asked what was in their packs the answer included things like canned beans and two gallons of water. Ouch! Leave the heavy stuff at home. 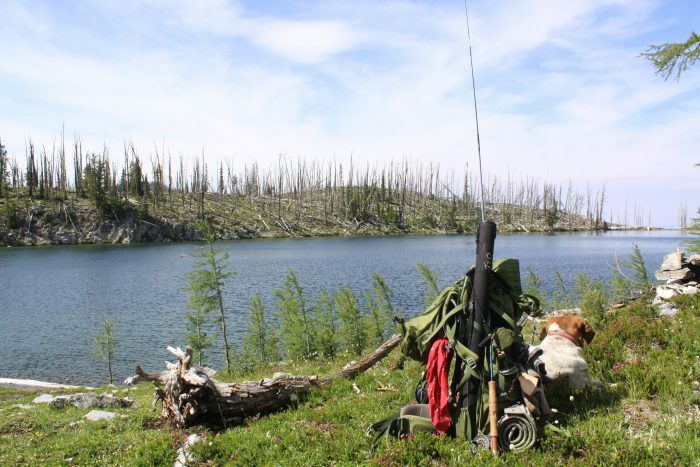 A full day’s supply of vittles shouldn’t weigh more than 2 pounds and there is no reason to carry more than about two quarts of water – not in Montana anyway. (there could be exceptions in specific areas). Everything you need from breakfast lunch and dinner should fit inside a one gallon zip lock bag and won’t weigh you down. Pick a few huckleberries along the way for those pancakes! Butter, garlic, salt pepper and then catch a fish – yum! These meals are easy to prepare, cheap and don’t weigh much. Next time you are headed out for a few days leave the heavy stuff at home. 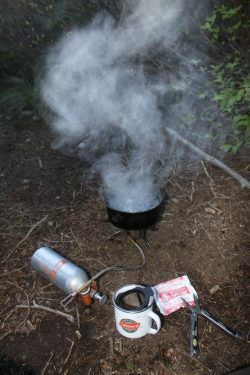 Boil water in camp and make delicious food that isn’t tough to carry.